We are happy to announce the release of CodeSmith Generator 7.0 Beta today. We have been working hard on Generator 7 for the past couple of months. We have focused on improving existing scenarios, adding requested functionality and paying close attention to detail. The primary feature for this release is better integration with Visual Studio 2012 and 2013 while improving performance across the board. We also focused heavily on improving the editor experience. We believe you will love Generator 7.0! Native Windows 8 metro themes. 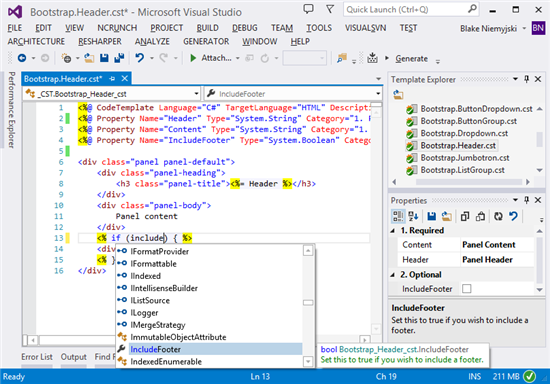 Added several new templates including Bootstrap 3.0 and TypeScript templates. Updated the PLINQO and CSLA Frameworks to target .NET 4.5 and VS 2012/2013. For a full list of changes please see the release notes. We still have some work to do on Generator 7 and the templates, but we feel like we are at a very usable point and would love to start getting your feedback. Thanks and we look forward to your continued feedback!